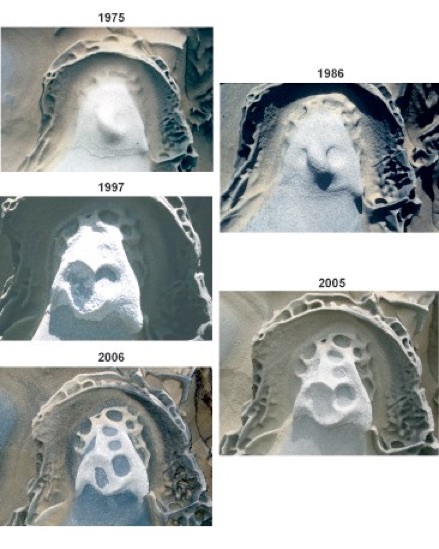 Evidence of Tafoni Changing over Time. Pebble Beach. Below are three time series photographs and precise morphometric measurements of more than 100 tafoni features, made 29 years apart (1977 and again in 2006). Note that pits enlarge and tafoni coalesce when cavity walls break down. Pebble Beach 3 shows a wall emerging from the rock surface. Baseline images and measurements from 1977 collected by Ray Pestrong. Dr. Kuenen. 44-Year Time Lapse Animation. In this animation I layered two photographs of the same outcrop taken from the same perspective 44 years apart. The first image is a photograph made by Ray Pestrong and taken in 1960 when Dr. Philip Henry Kuenen visited Stanford University. This initial image gradually fades away revealing a picture made 44 years later, in 2004. There are some alignable differences such as new pits, taller walls, and cavities deeper. If you pause the animation about 2/3 through, you may notice new tafoni near the top right of the image. One striking feature is the amount of erosion of the rocks above and behind this cliff face. The central figure is the pioneering marine geologist, Dr. Kuenen, who visited this beach to investigate the textbook quality turbidite forms. Blue-Eyed Madonna. In this sequence of images, the same central figure is captured over a 31-year period. The head of the Blue-Eyed Madonna is the same size as a human head. Photographs prior to 2005 were made by Ray Pestrong. Camp Reynolds, Angel Island State Park. 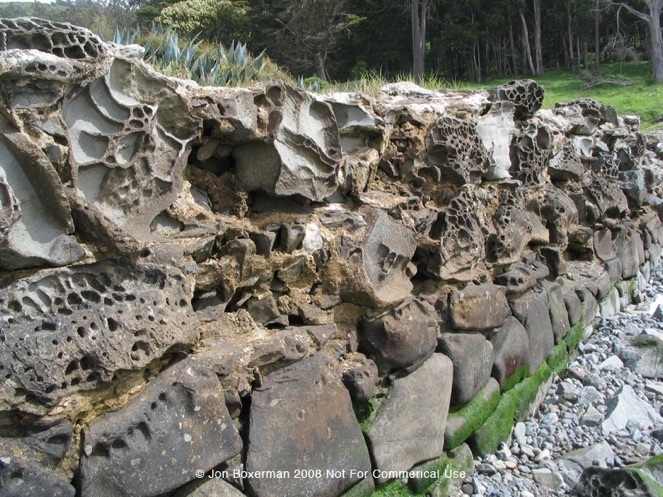 Probably built around 1880, this seawall at Camp Reynolds is heavily weathered with tafoni. The sandstone blocks were quarried from an outcrop on the island. Note that the sandstone blocks at sea level do not form tafoni but ones 1 to 2 meters above sea level, in the spray zone have well-developed tafoni. Many tafoni are more than 6 cm deep, suggesting that these tafoni deepen as fast as 0.5 mm/year, or about 60 mm over 125 years.